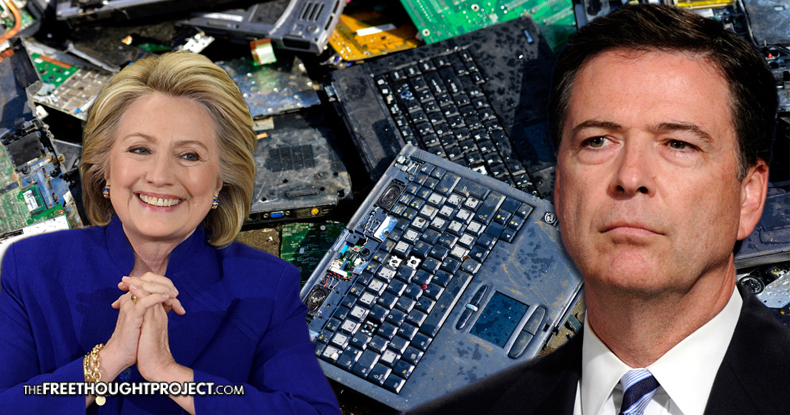 FBI Busted For Allowing the Destruction of Clinton's Aides' Laptops in Special "Side Agreements"
A newly released letter from Chairman of the House Judiciary Committee, Bob Goodlatte, addressed to Attorney General Loretta Lynch shows the FBI made side agreements with Hillary Clinton’s aides Cheryl Mills and Heather Samuelson to “destroy” their “laptops” at the conclusion of its search. Destroying the laptops of two of Clinton’s most trusted aides would, of course, prevent further investigation by the FBI or any other agency — which begs a few rather imperative questions. With immunity in place for the aides, the arbitrary deadline for searching the laptops and the permission to destroy them are both oddly incongruent — unless, of course, the laptops contained vital information the DOJ, or perhaps the FBI, didn’t want revealed. Indeed, the DOJ granted Mills and Samuelson immunity from prosecution for … potential destruction of evidence. “Doesn’t the willingness of Ms. Mills and Ms. Samuelson to have their laptops destroyed by the FBI contradict their claims that the laptops could have been withheld because they contained non-relevant, privileged information? If so, doesn’t that undermine the claim that the side agreements were necessary? While FBI Director James Comey failed to recommend the DOJ charge Hillary Clinton over the “careless” use of a personal server, among many other possible avenues of prosecution, a number of astonishing revelations were nonetheless revealed in the investigation which could have been pursued by another agency or by Congress. Many failed to follow the logic of Comey’s recommendation, as even in the course of his announcement, several contradictions seemed to prove the case for prosecution — or at least a more extensive investigation. But if the FBI did, indeed, destroy Mills’ and Samuelson’s laptops, further probes wouldn’t have all the relevant information. Goodlatte also requests Lynch reveal whether additional immunity agreements beyond destruction of evidence were granted to Mills and Samuelson, as well as if a grand jury was ever convened to investigate Clinton’s private server. Although the embattled Democratic presidential nominee and the DNC have downplayed the personal server and transmission of classified information through unsecured channels, it seems the scandal continues to grow new teeth.